Hello everybody! I hope you’re doing fine. Today I was thinking about sharing my Ebay wish list which became rather short lately. I’m estonished how it is possible!! I remember the beginnings of my Kbeauty trip when I had the pages and pages of products on my WL. I was reading a lot of reviews, following lot of bloggers and youtube channels, I was exploring hundreds of products and as a result of all this, I wanted and needed everything. This was back in 2015 and 2016. But how time was passing, the picture became a bit clearer, as well as my cosmetic wishes. Since then, I tried lot of products, I made lot of orders, mostly on Ebay and I spent a lot of money on skincare products. 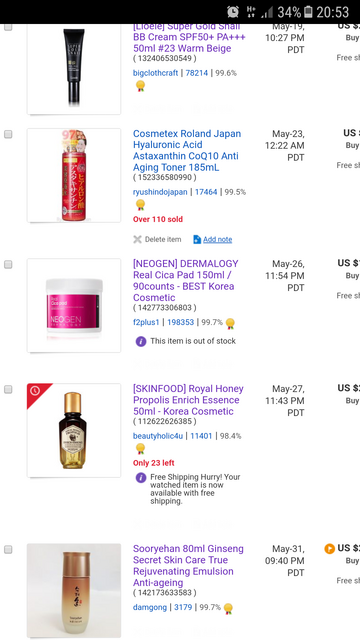 I could tell you exactly how much money I am talking about since, about the same time as my Kbeauty trip began, I started to use xls spreadsheets for my orders, stocks and dates when I opened the products. However, I will not write about the money I spent, but I will write about where I would like to spend some more money. So, what do I have on my WL? Which are these 10 products? And before I start, let me just reassure you that the links I posted are not the referral links and I do not gain anything if you buy by clicking on those. How could I? 😂😂😂 (I’m only a “blogger” with 4 posts and 4 follwers). So let’s go to my WL finally! – Cosmetic pots (plastic) – I’m always decanting my products, especially when I travel, so I’m always in need of small jars and bottles. 2) Olivarrier Dual Moist toning lotion – I always listen what Rene a.k.a. Gothamista recommends and she mentionned Olivarrier, as one of brands she is exploring lately. Sooreyahan Ginseng Secret Skin Care True Rejuvenating Emulsion – this is on my WL for a while now that I honestly do not remember why I put it there. Lioele Super gold snail bb cream – although Missha Perfect cover bb cream in shade #27 is my perfect choice, I’m always looking for something that could replace it since this shade is sometimes hard to find, unlike lighter shades. Up till now, I didn’t find anything even close to my perfect Missha. A by Bom Super Power Baby Ultra Cool Leaf mask – I’m a huge fan of sheet masks and accordingly, I have a huge stash of these. One of my next post will be about sheet masks for sure. This particular sheet mask drew my attention because of the interestong shape (you put the leaves on the face). 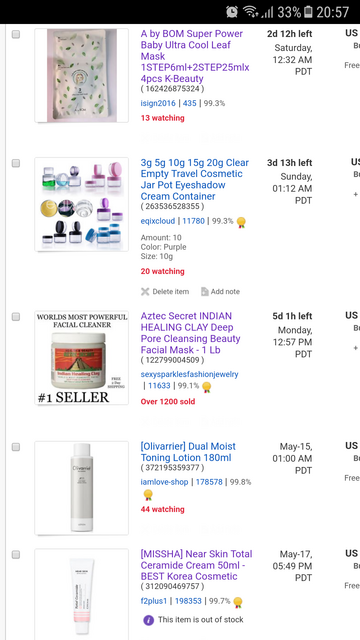 Aztec Secret Indian Healing Clay Deep Pore Cleansing mask – I’m always looking for a good clay mask and this one has the excellent reviews. And last item on my WL are the Neogen Dermalogy Real Cica pads – this is rather new product, but I read some fine reviews. I like the products containing cica or tiger grass or centella asiatica, so this is very interesting product for me. If you tried some of products from my WL, please do share with me your opinion. Next Post My new arrivals: what did I buy lately?